← Pay authors, or make them pay? To be perfectly honest, I wasn’t all that interested in the Women in Sport book. That’s not because I thought Rachel Ignotofsky’s book was bad; just that I’m not that much into sport. But the way it is for women right now, how could I not read Rachel’s book? I began by looking at the list of her 50 women, feeling a deep sense of shock at discovering I’d not heard of all that many. Why, when I have heard of lots of male athletes? I suspect it’s because they have kept quiet about the women, especially those from longer ago. I didn’t expect to find the book all that interesting, despite what I’ve said above. But there’s something about the way these women, often only girls at the time, kept at it. In the face of what society said and thought, they practised until they were really good at their sport, and then they insisted on taking part in games and even on winning, when the world didn’t want them to. And it’s probably not because the men thought they’d be losing to these weak creatures; I’m guessing they really thought they were not up to it. Go Billie Jean King! There I was, reading away about the many inspiring women, and I actually wanted to cry. I think it was the kind of crying when you are really, truly touched by what someone has achieved. Because I couldn’t even think myself into their mindsets when struggling to be allowed to join in. I’m just so proud of what they all did, every single one of them. Thanks for all you did, and continue to do, ladies! 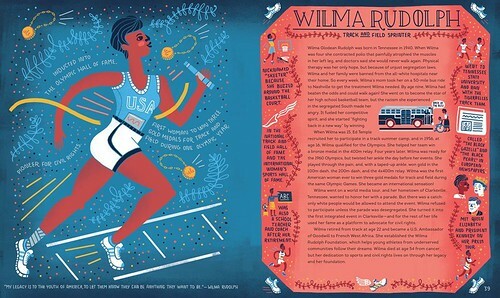 This entry was posted in Authors, Books, History, Picture book, Reading, Review and tagged Rachel Ignotofsky. Bookmark the permalink.